When you see wild rice chances are it's not. Authentic wild rice is Native American hand harvested from the wild by canoe, and wood fire parched. The vast majority of today's 'wild rice' is a hybrid and not at all wild. It's cultivated, grown in paddies, and machine harvested all at the same time. These paddy grown varieties are dark black-brown in color, tough, hard to chew, require twice as long to cook (50 to 60 minutes), and have comparatively little taste. Authentic wild harvested wild rice ranges in color from light brown, to greenish-brown, to deep brown. It cooks in 25 to 30 minutes, is light and fluffy, and its flavor is rich and delicious. It's harvested over time as the seeds mature at different times. Canoe harvesting ensures only the ripe rice is harvested. In Ojibwa and Chippewa history their ancestors were told by the Great Spirit to move westward from their home in the east, or perish. They were told to go to the land where food grows upon the water. Upon reaching this place their western migration stopped. The food growing upon the water was wild rice. It has been a most important food staple of Native Americans for eons, especially the Ojibwa and Chippewa (Anishinaabeg), the Menominee (Mamaceqtaw), the Cree and the Sioux. They called wild rice 'manoomin', meaning 'good berry', and introduced it to European settlers who in turn used it as a staple food. Early English explorers called it wild rice or Indian rice, and the French called it 'folle avoine' or crazy oats. 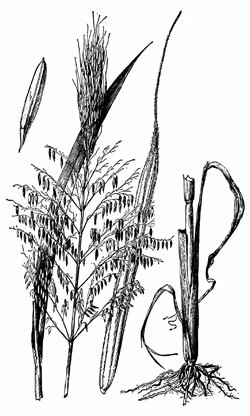 Other names were Tuscarora rice, Canadian rice, water oats, blackbird oats, and marsh rice. The English name has persisted, although we think 'good berry' more apt. Wild rice is the seed or fruit of an annual aquatic, reed-like grass belonging the Zizania genus of the Poaceae (Gramineae) grain family. It is a robust plant that grows to a height of 12 feet, with a two foot flowering panicle. It is not a true rice of the Oryza genus. It is used as cereal grain, but is classified as a pseudo-grain. There are four species of wild rice. 1.) Eastern wild rice Zizania aquatica grows in the St. Lawrence River area and in the Atlantic and Gulf states, and is not usually harvested for food, although it is edible. 2.) Northern wild rice Zizania palustris is native to the Great Lakes region of North America and grows primarily in Minnesota, Wisconsin, northern Michigan, Ontario, Manitoba, and Saskatchewan. The growing range of northern wild rice was once far greater than today, its habitat being greatly reduced by the westward migration of European settlers, modern dredging of lakes and rivers, and water pollution. There are thousands of different northern wild rice varieties, which grow in different lakes. Water quality, temperature, depth and composition of the mud in the rice beds determine the variety that grows in each area. True wild rice cannot be cultivated in paddies, as it is very selective about its growing environment and water conditions. 3.) Texas wild rice Zizania texana is a perennial found only in a very small area of central Texas along the San Marcos River. It is in danger of extinction from pollution and loss of habitat. 4.) Manchurian wild rice Zizania latifolia is a perennial native to China where it was once a staple grain, but it is now nearly extinct having disappeared from its wild native habitat. This species was, however, introduced to New Zealand accidentally and is classified as an invasive species. Wild rice is the only native North America grain and northern wild rice is the only species harvested for its grain. Eden Wild Rice is authentic, northern wild rice Zizania palustris, the true grain of North America's indigenous people. It is hand harvested by the Minnesota Leech Lake band of Ojibwa, Native Americans, in canoes as required by law. This species of wild rice has been found in archaeological sites radiocarbon dated back over 12,000 years. Eden Wild Rice is traditionally harvested as it has been for many generations, by canoe. Early in the morning of the month the Ojibwa call Manoominike Gilziz or the wild rice making moon (end of August to mid September), hundreds of rice harvesters paddle canoes to hand harvest the first ripened wild rice. There are two people in each canoe, a poler who stands in the back and a knocker in the middle. The rice is too dense to paddle through. Gasoline boats pollute and are not allowed by law. The poler pushes the canoe through the stands using a 20 feet long forked pole. Standing allows the poler to quickly and easily spot the darker patches of ripened rice. The poler is strong and agile, poling quickly to the grain. The knocker uses two cedar wood sticks resembling long drumsticks to harvest the rice. Alternating between left hand and right hand, the knocker uses one stick to gently pull the rice stalk over the canoe, and the other to gently tap the rice loose from the stalk into the canoe. This method ensures only the ripe grains fall into the canoe. Unripe grain adheres to the stalk and continues to ripen. When the canoes are full after two hours or most of the day, the rice is taken ashore and parched in a wood fired, rotating roaster before winnowing to remove its chaff. Roasting over a wood fire gives the wild rice its mild nutty flavor and aroma. Every day the ricers repeat the same journey through the rice beds until all of the rice is harvested. Wild rice is not just a traditional food, or source of income for Native Americans. It is a gift from the Great Spirit, and a sacred component of their culture, honored in their ceremonies and embedded in their way of life. Wild rice stands are also a vital part of the ecology of thousands of lakes and rivers. As the grain ripens and during harvesting, some of the grain falls into the lakebeds, reseeding the beds for next year's harvest. The rice stands provide a unique habitat for thousands of waterfowl, fish and other wildlife who rely on it as a food, and they are an important nesting haven. Eden Wild Rice helps this age-old tradition to continue, ensuring that Native Americans remain connected to the land and their traditional way of life, and is also supporting the ecology of the Great Lakes region. Wild rice is not just for holidays or special occasions. This delicious, light and fluffy grain can be used as a staple grain year round, in soups, stews, salads, grain burgers, desserts, pancakes, waffles, and bread making. It can be combined and cooked with other grains as well. Combine it with vegetables, nuts, seeds and dried fruit for stuffing. It stores well in a dry, cool, and dark place, and its flavor doesn't diminish. Eden Wild Rice is a Heart Healthy* whole grain. It's a good source of dietary fiber, protein, niacin (B3), magnesium and zinc, and a rich source of manganese. *Diets rich in whole grain foods and other plant foods and low in total fat, saturated fat, and cholesterol may reduce the risk of heart disease and some cancers.